Geothermal power is power generated by geothermal energy. Technologies in use include dry steam power stations, flash steam power stations and binary cycle power stations. Geothermal electricity generation is currently used in 24 countries, while geothermal heating is in use in 70 countries. As of 2015, worldwide geothermal power capacity amounts to 12.8 gigawatts (GW), of which 28 percent or 3,548 megawatts (MW) are installed in the United States. International markets grew at an average annual rate of 5 percent over the three years to 2015, and global geothermal power capacity is expected to reach 14.5–17.6 GW by 2020. Based on current geologic knowledge and technology the GEA publicly discloses, the Geothermal Energy Association (GEA) estimates that only 6.9 percent of total global potential has been tapped so far, while the IPCC reported geothermal power potential to be in the range of 35 GW to 2 TW. Countries generating more than 15 percent of their electricity from geothermal sources include El Salvador, Kenya, the Philippines, Iceland, New Zealand and Costa Rica. Geothermal power is considered to be a sustainable, renewable source of energy because the heat extraction is small compared with the Earth's heat content. The greenhouse gas emissions of geothermal electric stations are on average 45 grams of carbon dioxide per kilowatt-hour of electricity, or less than 5 percent of that of conventional coal-fired plants. As a source of renewable energy for both power and heating, geothermal has the potential to meet 3-5% of global demand by 2050. With economic incentives, it is estimated that by 2100 it will be possible to meet 10% of global demand. In the 20th century, demand for electricity led to the consideration of geothermal power as a generating source. Prince Piero Ginori Conti tested the first geothermal power generator on 4 July 1904 in Larderello, Italy. It successfully lit four light bulbs. Later, in 1911, the world's first commercial geothermal power station was built there. Experimental generators were built in Beppu, Japan and the Geysers, California, in the 1920s, but Italy was the world's only industrial producer of geothermal electricity until 1958. Global geothermal electric capacity. Upper red line is installed capacity; lower green line is realized production. In 1958, New Zealand became the second major industrial producer of geothermal electricity when its Wairakei station was commissioned. Wairakei was the first station to use flash steam technology. Over the past 60 years, net fluid production has been in excess of 2.5 km3. Subsidience at Wairakei-Tauhara has been an issue in a number of formal hearings related to environmental consents for expanded development of the system as a source of renewable energy. In 1960, Pacific Gas and Electric began operation of the first successful geothermal electric power station in the United States at The Geysers in California. The original turbine lasted for more than 30 years and produced 11 MW net power. The binary cycle power station was first demonstrated in 1967 in the Soviet Union and later introduced to the United States in 1981, following the 1970s energy crisis and significant changes in regulatory policies. This technology allows the use of much lower temperature resources than were previously recoverable. In 2006, a binary cycle station in Chena Hot Springs, Alaska, came on-line, producing electricity from a record low fluid temperature of 57 °C (135 °F). Geothermal electric stations have until recently been built exclusively where high-temperature geothermal resources are available near the surface. The development of binary cycle power plants and improvements in drilling and extraction technology may enable enhanced geothermal systems over a much greater geographical range. Demonstration projects are operational in Landau-Pfalz, Germany, and Soultz-sous-Forêts, France, while an earlier effort in Basel, Switzerland was shut down after it triggered earthquakes. Other demonstration projects are under construction in Australia, the United Kingdom, and the United States of America. The thermal efficiency of geothermal electric stations is low, around 7–10%, because geothermal fluids are at a low temperature compared with steam from boilers. By the laws of thermodynamics this low temperature limits the efficiency of heat engines in extracting useful energy during the generation of electricity. Exhaust heat is wasted, unless it can be used directly and locally, for example in greenhouses, timber mills, and district heating. The efficiency of the system does not affect operational costs as it would for a coal or other fossil fuel plant, but it does factor into the viability of the station. In order to produce more energy than the pumps consume, electricity generation requires high-temperature geothermal fields and specialized heat cycles. Because geothermal power does not rely on variable sources of energy, unlike, for example, wind or solar, its capacity factor can be quite large – up to 96% has been demonstrated. However the global average capacity factor was 74.5% in 2008, according to the IPCC. The Earth’s heat content is about 1×1019 TJ (2.8×1015 TWh). This heat naturally flows to the surface by conduction at a rate of 44.2 TW and is replenished by radioactive decay at a rate of 30 TW. These power rates are more than double humanity’s current energy consumption from primary sources, but most of this power is too diffuse (approximately 0.1 W/m2 on average) to be recoverable. The Earth's crust effectively acts as a thick insulating blanket which must be pierced by fluid conduits (of magma, water or other) to release the heat underneath. Electricity generation requires high-temperature resources that can only come from deep underground. The heat must be carried to the surface by fluid circulation, either through magma conduits, hot springs, hydrothermal circulation, oil wells, drilled water wells, or a combination of these. This circulation sometimes exists naturally where the crust is thin: magma conduits bring heat close to the surface, and hot springs bring the heat to the surface. If no hot spring is available, a well must be drilled into a hot aquifer. 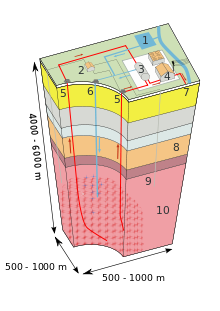 Away from tectonic plate boundaries the geothermal gradient is 25–30 °C per kilometre (km) of depth in most of the world, so wells would have to be several kilometres deep to permit electricity generation. The quantity and quality of recoverable resources improves with drilling depth and proximity to tectonic plate boundaries. In ground that is hot but dry, or where water pressure is inadequate, injected fluid can stimulate production. Developers bore two holes into a candidate site, and fracture the rock between them with explosives or high-pressure water. Then they pump water or liquefied carbon dioxide down one borehole, and it comes up the other borehole as a gas. This approach is called hot dry rock geothermal energy in Europe, or enhanced geothermal systems in North America. Much greater potential may be available from this approach than from conventional tapping of natural aquifers. Estimates of the electricity generating potential of geothermal energy vary from 35 to 2000 GW depending on the scale of investments. This does not include non-electric heat recovered by co-generation, geothermal heat pumps and other direct use. A 2006 report by the Massachusetts Institute of Technology (MIT) that included the potential of enhanced geothermal systems estimated that investing US$1 billion in research and development over 15 years would allow the creation of 100 GW of electrical generating capacity by 2050 in the United States alone. The MIT report estimated that over 200×109 TJ (200 ZJ; 5.6×107 TWh) would be extractable, with the potential to increase this to over 2,000 ZJ with technology improvements – sufficient to provide all the world's present energy needs for several millennia. At present, geothermal wells are rarely more than 3 km (1.9 mi) deep. Upper estimates of geothermal resources assume wells as deep as 10 km (6.2 mi). Drilling near this depth is now possible in the petroleum industry, although it is an expensive process. The deepest research well in the world, the Kola superdeep borehole (KSDB-3), is 12.261 km (7.619 mi) deep. This record has recently been imitated by commercial oil wells, such as Exxon's Z-12 well in the Chayvo field, Sakhalin. Wells drilled to depths greater than 4 km (2.5 mi) generally incur drilling costs in the tens of millions of dollars. The technological challenges are to drill wide bores at low cost and to break larger volumes of rock. 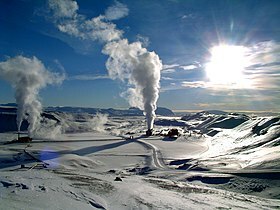 Geothermal power is considered to be sustainable because the heat extraction is small compared to the Earth's heat content, but extraction must still be monitored to avoid local depletion. Although geothermal sites are capable of providing heat for many decades, individual wells may cool down or run out of water. The three oldest sites, at Larderello, Wairakei, and the Geysers have all reduced production from their peaks. It is not clear whether these stations extracted energy faster than it was replenished from greater depths, or whether the aquifers supplying them are being depleted. If production is reduced, and water is reinjected, these wells could theoretically recover their full potential. Such mitigation strategies have already been implemented at some sites. The long-term sustainability of geothermal energy has been demonstrated at the Lardarello field in Italy since 1913, at the Wairakei field in New Zealand since 1958, and at The Geysers field in California since 1960. Dry steam (left), flash steam (centre), and binary cycle (right) power stations. Geothermal power stations are similar to other steam turbine thermal power stations in that heat from a fuel source (in geothermal's case, the Earth's core) is used to heat water or another working fluid. The working fluid is then used to turn a turbine of a generator, thereby producing electricity. The fluid is then cooled and returned to the heat source. Dry steam stations are the simplest and oldest design. This type of power station is not found very often, because it requires a resource that produces dry steam, but is the most efficient, with the simplest facilities. In these sites, there may be liquid water present in the reservoir, but no water is produced to the surface, only steam. Dry Steam Power directly uses geothermal steam of 150 °C or greater to turn turbines. As the turbine rotates it powers a generator which then produces electricity and adds to the power field. Then, the steam is emitted to a condenser. Here the steam turns back into a liquid which then cools the water. After the water is cooled it flows down a pipe that conducts the condensate back into deep wells, where it can be reheated and produced again. At The Geysers in California, after the first thirty years of power production, the steam supply had depleted and generation was substantially reduced. To restore some of the former capacity, supplemental water injection was developed during the 1990s and 2000s, including utilization of effluent from nearby municipal sewage treatment facilities. Flash steam stations pull deep, high-pressure hot water into lower-pressure tanks and use the resulting flashed steam to drive turbines. They require fluid temperatures of at least 180 °C, usually more. This is the most common type of station in operation today. Flash steam plants use geothermal reservoirs of water with temperatures greater than 360 °F (182 °C). The hot water flows up through wells in the ground under its own pressure. As it flows upward, the pressure decreases and some of the hot water boils into steam. The steam is then separated from the water and used to power a turbine/generator. Any leftover water and condensed steam may be injected back into the reservoir, making this a potentially sustainable resource. Binary cycle power stations are the most recent development, and can accept fluid temperatures as low as 57 °C. The moderately hot geothermal water is passed by a secondary fluid with a much lower boiling point than water. This causes the secondary fluid to flash vaporize, which then drives the turbines. This is the most common type of geothermal electricity station being constructed today. Both Organic Rankine and Kalina cycles are used. The thermal efficiency of this type of station is typically about 10–13%. The International Geothermal Association (IGA) has reported that 10,715 megawatts (MW) of geothermal power in 24 countries is online, which is expected to generate 67,246 GWh of electricity in 2010. This represents a 20% increase in geothermal power online capacity since 2005. IGA projected this would grow to 18,500 MW by 2015, due to the large number of projects that were under consideration, often in areas previously assumed to have little exploitable resource. In 2010, the United States led the world in geothermal electricity production with 3,086 MW of installed capacity from 77 power stations; the largest group of geothermal power plants in the world is located at The Geysers, a geothermal field in California. The Philippines follows the US as the second highest producer of geothermal power in the world, with 1,904 MW of capacity online; geothermal power makes up approximately 27% of the country's electricity generation. Al Gore said in The Climate Project Asia Pacific Summit that Indonesia could become a super power country in electricity production from geothermal energy. India has announced a plan to develop the country's first geothermal power facility in Chhattisgarh. Canada is the only major country on the Pacific Ring of Fire which has not yet developed geothermal power. The region of greatest potential is the Canadian Cordillera, stretching from British Columbia to the Yukon, where estimates of generating output have ranged from 1,550 MW to 5,000 MW. 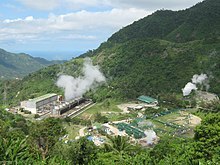 A geothermal power station in Negros Oriental, Philippines. The largest group of geothermal power plants in the world is located at The Geysers, a geothermal field in California, United States. As of 2004, five countries (El Salvador, Kenya, the Philippines, Iceland, and Costa Rica) generate more than 15% of their electricity from geothermal sources. Geothermal electricity is generated in the 24 countries listed in the table below. During 2005, contracts were placed for an additional 500 MW of electrical capacity in the United States, while there were also stations under construction in 11 other countries. Enhanced geothermal systems that are several kilometres in depth are operational in France and Germany and are being developed or evaluated in at least four other countries. 2 per megawatt-hour when not coupled with carbon capture and storage (CCS). Stations that experience high levels of acids and volatile chemicals are usually equipped with emission-control systems to reduce the exhaust. Geothermal stations could theoretically inject these gases back into the earth, as a form of carbon capture and storage. In addition to dissolved gases, hot water from geothermal sources may hold in solution trace amounts of toxic chemicals, such as mercury, arsenic, boron, antimony, and salt. These chemicals come out of solution as the water cools, and can cause environmental damage if released. The modern practice of injecting geothermal fluids back into the Earth to stimulate production has the side benefit of reducing this environmental risk. Station construction can adversely affect land stability. Subsidence has occurred in the Wairakei field in New Zealand. Enhanced geothermal systems can trigger earthquakes due to water injection. The project in Basel, Switzerland was suspended because more than 10,000 seismic events measuring up to 3.4 on the Richter Scale occurred over the first 6 days of water injection. The risk of geothermal drilling leading to uplift has been experienced in Staufen im Breisgau. Geothermal has minimal land and freshwater requirements. Geothermal stations use 404 square meters per GW·h versus 3,632 and 1,335 square meters for coal facilities and wind farms respectively. They use 20 litres of freshwater per MW·h versus over 1000 litres per MW·h for nuclear, coal, or oil. Geothermal power stations can also disrupt the natural cycles of geysers. For example, the Beowawe, Nevada geysers, which were uncapped geothermal wells, stopped erupting due to the development of the dual-flash station. See also: Cost of electricity by source. Geothermal power requires no fuel; it is therefore immune to fuel cost fluctuations. However, capital costs tend to be high. Drilling accounts for over half the costs, and exploration of deep resources entails significant risks. A typical well doublet in Nevada can support 4.5 megawatts (MW) of electricity generation and costs about $10 million to drill, with a 20% failure rate. In total, electrical station construction and well drilling costs about 2–5 million € per MW of electrical capacity, while the levelised energy cost is 0.04–0.10 € per kW·h. Enhanced geothermal systems tend to be on the high side of these ranges, with capital costs above $4 million per MW and levelized costs above $0.054 per kW·h in 2007. Geothermal power is highly scalable: a small power station can supply a rural village, though initial capital costs can be high. The most developed geothermal field is the Geysers in California. In 2008, this field supported 15 stations, all owned by Calpine, with a total generating capacity of 725 MW. ^ a b c Geothermal Energy Association. Geothermal Energy: International Market Update May 2010, p. 4-6. ^ "The International Geothermal Market At a Glance – May 2015" (PDF). GEA—Geothermal Energy Association. May 2015. ^ a b c Craig, William; Gavin, Kenneth (2018). Geothermal Energy, Heat Exchange Systems and Energy Piles. London: ICE Publishing. pp. 41–42. ISBN 9780727763983. ^ IPENZ Engineering Heritage. Ipenz.org.nz. Retrieved 13 December 2013. ^ Bertani, Ruggero (2009). "Geothermal Energy: An Overview on Resources and Potential" (PDF). Proceedings of the International Conference on National Development of Geothermal Energy Use. Slovakia. ^ Schavemaker, Pieter; van der Sluis, Lou (2008). Electrical Power Systems Essentials. John Wiley & Sons, Ltd. ISBN 978-0470-51027-8. ^ Goldstein, B., G. Hiriart, R. Bertani, C. Bromley, L. Gutiérrez-Negrín, E. Huenges, H. Muraoka, A. Ragnarsson, J. Tester, V. Zui (2011) "Geothermal Energy". In IPCC Special Report on Renewable Energy Sources and Climate Change Mitigation, Cambridge University Press, Cambridge, United Kingdom and New York, NY, USA Geothermal Energy. p. 404. ^ "Kola". www.icdp-online.org. ICDP. Retrieved 27 May 2018. ^ Tabak, John (2009). Solar and Geothermal Energy. New York: Facts On File, Inc. pp. 97–183. ISBN 978-0-8160-7086-2. ^ "Geothermal Energy". National Geographic. National Geographic Society. Retrieved 9 March 2018. ^ Gawell, Karl (June 2014). "Economic Costs and Benefits of Geothermal Power" (PDF). Geothermal Energy Association. Retrieved 9 March 2018. ^ US DOE EERE Hydrothermal Power Systems. eere.energy.gov (22 February 2012). Retrieved 2013-12-13. ^ Geothermal Energy. National Geographic. ^ "Geothermal Basics Overview". Office of Energy Efficiency and Renewable Energy. Archived from the original on 4 October 2008. Retrieved 1 October 2008. ^ a b Geothermal Energy Association. Geothermal Energy: International Market Update May 2010, p. 7. ^ Indonesia can be super power on geothermal energy : Al Gore. ANTARA News (9 January 2011). Retrieved 2013-12-13. ^ India's 1st geothermal power plant to come up in Chhattisgarh – Economic Times. The Economic Times. (17 February 2013). Retrieved 2013-12-13. ^ a b "Calpine Corporation (CPN) (NYSE Arca) Profile" (Press release). Reuters. Retrieved 14 October 2009. ^ "Global geothermal capacity reaches 14,369 MW – Top 10 Geothermal Countries, Oct 2018". Think GeoEnergy - Geothermal Energy News. Retrieved 13 January 2019. ^ "Energy in New Zealand". New Zealand Ministry of Economic Development. September 2014. Retrieved 22 April 2015. ^ Sanyal, Subir K.; Morrow, James W.; Butler, Steven J.; Robertson-Tait, Ann (22 January 2007). "Cost of Electricity from Enhanced Geothermal Systems" (PDF). Proc. Thirty-Second Workshop on Geothermal Reservoir Engineering. Stanford, California.